Solstice is a wireless display option available in some classrooms and conference rooms at Indiana University. For more, see About Solstice at IU. Before you can connect to a Solstice display, you'll need to install the Solstice Client app on your device. Recently used: If you have connected to Solstice before, you’ll see a list of your previously used displays under "RECENTLY USED". Click a display name to connect to it. 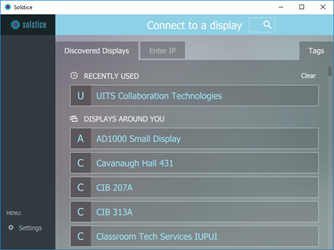 Available displays: Under "DISPLAYS AROUND YOU", you can scroll through the list of Solstice-enabled displays available around you. Click a display name to connect to it. Tags: Click the Tags tab at the top right of the Solstice app to choose filters to narrow the listed displays by campus, building, and department. After you've chosen one or more filters, click back in the list of "DISPLAYS AROUND YOU" to see the filtered results, and click a display name to connect to it. Search: At the top of the Solstice app, in the "Connect to a display" search field, begin typing a room's display name; you'll see a filtered list of displays that match your search string. Click a display name to connect to it. Enter the IP Address: If you don't find your display using any of the methods above, you can connect using the display's IP address. The room's display name and IP address rotate in the bottom left corner of the room's display. From the Solstice app, select the Enter IP tab, type the display's IP address (this will be a numeric string in the form 123.456.654.321), and then click Go to connect. When prompted for a screen key in the Solstice Client app, enter the four-digit key shown on the room's display screen, and then click Ok to finish connecting wirelessly to the display. The screen key prevents people who are not in the room from wirelessly sharing to the screen. The key will change each time all users have disconnected from the display. Once you've successfully connected to the Solstice display, you can wirelessly share content to the display and control all content shared to the display. This is document aogn in the Knowledge Base. Last modified on 2017-12-08 10:39:14.